FOX Network is a USA-based TV network that is reportedly in the top three networks worldwide based on their revenue and international reach. Founded in October 1986, it is a main competitor to CBS, NBC, and ABC, and providers viewers with entertainment, news, and sports coverage, among others. Some of the sports that FOX network covers under its FOX Sports umbrella include NFL, golf, NCAA basketball and football, NASCAR, soccer, and baseball. FOX broadcasts high profile live sporting (soccer) events from time to time acquired by FOX Sports. 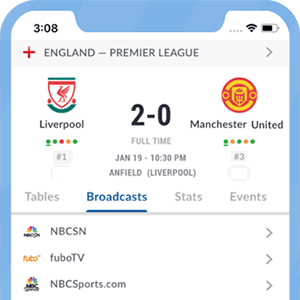 Normally such events are aired live on Fox Sports 1 and Fox Sports 2, but in order to reach a larger US audience, executive decisions are made to move such broadcasts to FOX Network. FOX has recently shown high profile matches from the German Bundesliga and the prestigious UEFA Champions League. The FOX Network channel is available over-the-air and also on all cable and satellite providers, reaching an estimated 97% of US households. FOX broadcasts in 720p (HDTV) and 480i (SDTV) signals and is available on national TV providers such as Dish Network and DirecTV through local channel offerings. For cord-cutters, FOX is now available on the popular OTT service Sling TV, on the Best of Live TV - Beta Multi-stream package. For more information about your local FOX Network affiliate channel, please check your local provider. For specific FOX local channel numbers, please verify here. *Got itLive Soccer TV does not provide FOX Network live streaming. The information provided on this page is simply FOX Network soccer TV schedule. Fox Sports Media has acquired the 2015 and 2019 FIFA Womens World Cup english language rights for the USA. FOX Sports owns the broadcasting rights of the German Bundesliga in the USA. Live Bundesliga matches are aired across channels in the FOX Sports network. Live Bundesliga matches are typically aired on FS1, FS2 and FOX Socer Plus in English, and on FOX Deportes in Spanish. Matches are available online on FOX Sports GO and FOX Soccer Match Pass. Fox Sports Media has acquired the 2018 and 2022 FIFA U17 and U20 World Cup English language rights for USA.